The Forest is an Amazing Classroom. Using our forests as a context for teaching can enrich student learning and extend it beyond the classroom walls. In Oregon, nearly 50 percent of our state's 61 million acres is forestland. Our forests supply renewable resources for lumber, paper and heating, along with jobs that support families and communities. They also provide us with an active playground and a quiet retreat. Because we depend so profoundly on our forests, it’s important for students to understand not only how they work, but also how we are connected to them ecologically, economically and socially. There are also many programs and materials to support forestry education in the field and the classroom. Please use the grade level links below to find out more about what is available to you and your class. The Oregon Forest Resources Institute has updated a set of guidelines aimed to help K-12 educators teach about Oregon's forests. 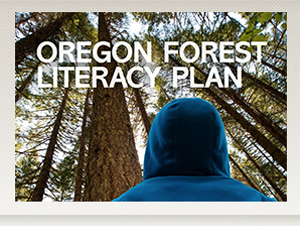 OFRI brought together a diverse, statewide group of forest resource specialists, educators and academics to develop the 2016 Oregon Forest Literacy Plan. The result of this collaboration is a document that gives teachers in our forest-rich state a strong foundation for developing curricula and classroom lessons related to forests and natural resources.